Over a decade ago, we loaded our children onto the trailers at the Christmas Tree Farm for a hayride into fields of evergreens where we chose and cut the family tree. It was the beginning of a treasured family tradition. Back then, we hauled diaper bags and sippy cups. Now my oldest is visiting from college and the youngest will be in high school next year but the fun of family quest for the perfect tree goes on. However, there were several years when we lived in a desert area, and there were no Christmas tree farms nearby. During those years of having an artificial tree, a friend would send us a fresh evergreen wreath. It was a fun way to have that fresh Christmas smell and look in the house. There are other creative ways to incorporate evergreens into your holiday decorating plan. Check out these great ideas from Homes.com. The October Housing Reports are out. Click the links below to get a snapshot of the market for that city. 25 – Homes sold in October 2016, 66.7 percent more than October 2015. $429,750 – Median price in October 2016, 60 percent more than in October 2015. 13.7 – Monthly housing inventory in October 2016, 3.5 months more than October 2015. 106 – Average number of days homes spent on the market in October 2016, the same as October 2015. 349 – Active home listings on the market in October 2016, 39 percent more than October 2015. 10 – Homes sold in October 2016, 16.7 percent less than October 2015. $154,025 – Median price in October 2016, 9 percent more than in October 2015. 3.0 – Monthly housing inventory in October 2016, .4 months less than October 2015. 66 – Average number of days homes spent on the market in October 2016, 10 days more than October 2015. 24 – Active home listings on the market in October 2016, 11.1 percent less than October 2015. 6 – Homes sold in October 2016, 100 percent more than October 2015. $135,000 – Median price in October 2016, 69 percent more than in October 2015. 10.8 – Monthly housing inventory in October 2016, 2.2 months less than October 2015. 261 – Average number of days homes spent on the market in October 2016, 58 days more than October 2015. 53 – Active home listings on the market in October 2016, 1.9 percent less than October 2015. 5 – Homes sold in October 2016, 28.6 percent less than October 2015. $165,000 – Median price in October 2016, 6 percent more than in October 2015. 5.6 – Monthly housing inventory in October 2016, 1.4 months less than October 2015. 29 – Average number of days homes spent on the market in October 2016, 25 days less than October 2015. 51 – Active home listings on the market in October 2016, 8.5 percent more than October 2015. The holidays are upon us! Maybe you have company coming in and will be looking for a fun activity to get you out of the house. There is no reason to drive all the way to Austin or San Antonio to find holiday fun when you can just zip on over to Marble Falls and check out the Walkway of Lights. 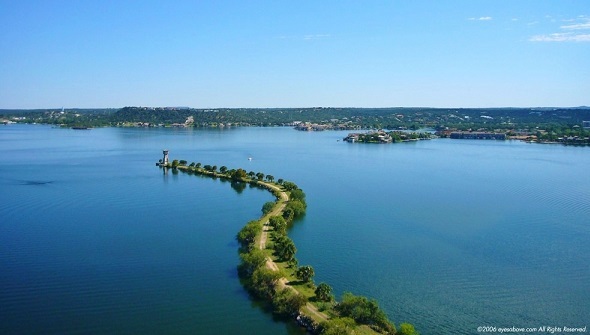 This beautiful display can be seen reflected in the water as you cross the bridge over Lake Marble Falls. Drive on down to Lakeside Park for a closer look. There is no admission fee to wander down the trail though hundreds of lighted sculptures. If Jack Frost comes nipping at your nose just chase him off with a cup of hot cocoa. The children may like a moment with the jolly old elf and you'll be standing by to take a photo of the moment. The Walkway will be open nightly from 6:00PM - 10:00PM November 18 through January 1.